**A spine poem?! I just found this quite creative blog. Not sure I could come up with a poem from the spines of our books, but I'm tempted to try. I imagine it could take awhile and I would get waylaid perusing books. **The new issue of Mollie Makes looks great. Check out the Sassy Sister Dolls on the front cover! 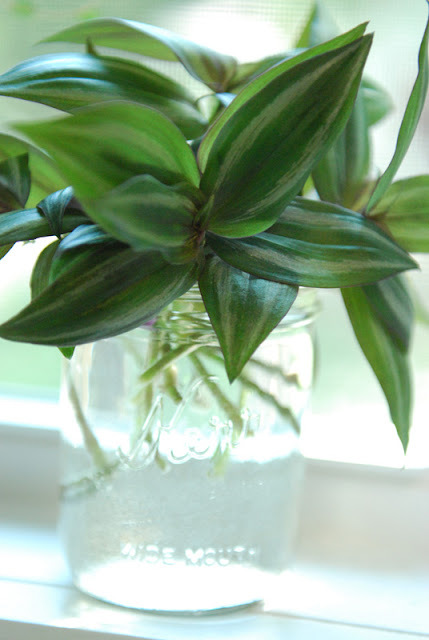 **I'm trying my hand at rooting some cuttings from a Wandering Jew I purchased from a local plant sale. This annual plant sale is much like a garage sale that a group of women host to raise funds for their church. They sell plants they propagate, grow from seed, or divided from their own gardens along with pots and garden supplies that they no longer need. Isn't that a good idea? Maybe in a couple of months I'll have some plants to share.